My own trip to discover the locations myself and prepare for an expedition. This is actually the trip where I met Sofie, my soulmate and mother of my son Kobe (aka Kobe-Wan Kenobi). It was rather exciting since this was actually going to be my very first Star Wars related trip, where I actually went in search of locations that were used by Lucasfilm in 1976 and 1997. I didn't visit all the locations. I never got to the Lars Exterior and the Dune Sea, just southwest of Nefta. Tozeur was the final stop at the time. So I had an excuse to go back. But I did get to the so-called Star Wars Canyon east of Tozeur. At the Jawa Rock, I picked up a small piece of rock from the canyon floor and took it home with me. It's still sitting on the mantlepiece in my study. 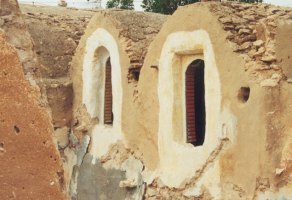 The Ksar Hadada at the time still had some window dressing from the Episode I shoot that had taken place a few years before. After posting my report online, I got swamped with requests for another trip. People wanted to come with me and visit Tatooine under my guidance. Who would have thought? So I launched a website where 12 people could book their trip with me. It sold out in a matter of days. Each paid for his own flight, hotel, food, etc... All I did was prepare a tour and book the hotels and jeeps. My only job was to make sure that our trip ran smootly. The 12 Pioneers were, in alphabetical order: Andrew (Australia), Bertil (Holland), Christiaan (Belgium), Colin (UK), Damien (Ireland), Daniel (USA), Grant (Australia), Jeroen (Belgium), Kevin (USA), Rob (USA), Terry (UK) and me. We have been good friends ever since. A trip like this makes for a special bond. 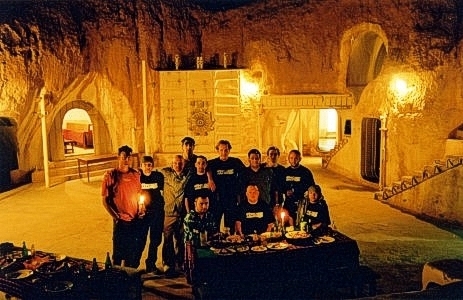 We had to bribe the owner of the Sidi Driss Hotel to allow us to have dinner in the Lars Homestead pit, but it was one of those memorable moments that will remain with us forever. We were even followed by a British film crew that created a documentary for London Weekend Television. They interviewed a couple of us at the Sidi Driss. This was also the very first time - for all of us, including me - to visit the Mos Espa set, the Dune Sea and the Lars Exterior. The igloo was still in great shape and we could even discern the indentations of the gravestones and the moisture vaporators. Amazing! We went back to the Lars Exterior in late evening to witness a binary sunset. I felt that it was time to go back again. It had been two years and I knew the sets were deteriorating. Both the climate and the lack of interest of the local populace would make sure that the sets would not be preserved for ever. I also decided that this was going to be my last trip to Tunisia, since I wanted to do some other things as well. There are more locations to discover! So I launched another one of those websites where people could enroll for the Final Trip to Tatooine. Since it would be my last trip, I decided to take a larger group along. I decided to fill up three jeeps, thus taking a group of 18 Pioneers. In alphabetical order: Andrea (Holland), Chrischi (Germany), Colin (UK), Cris (USA), Danien (Ireland), Daniel (Belgium), Erik (USA), Jan (Belgium), Jeroen (Belgium), Joeri (Belgium), Melanie (USA), Michel (Belgium), Patrick (Ireland), Rick (Holland), Samuel (Belgium), Thys (Belgium), Uschi (Belgium) and myself. There was one guy from Germany - Stefan - who tagged along, because he was writing an essay on movie travel. While the group was larger, I needn't have feared for it to become 'all work and no play'. There were a few veterans along for the ride, so everything went smoothly. It was extra interesting since we all had just seen Episode III in the cinema. But already it was clear that the sets were indeed changing. The 'igloo' at the Lars Exterior looked a bit worse for wear and the hydroponics garden was almost gone. The set dressing at the Sidi Driss hotel had already been repainted in another, darker color and the Ksar Hadada was in the process of re-modeling... I felt lucky to have seen the sets in a fresher condition two and four years previously. Nevertheless, this was a great expedition and a nice way to close the Tatooine chapter.